By Caz | March 11, 2019 | This post may contain affiliate links, which means we may receive a small commission, at no cost to you, if you make a purchase through a link. Read our Disclosure. 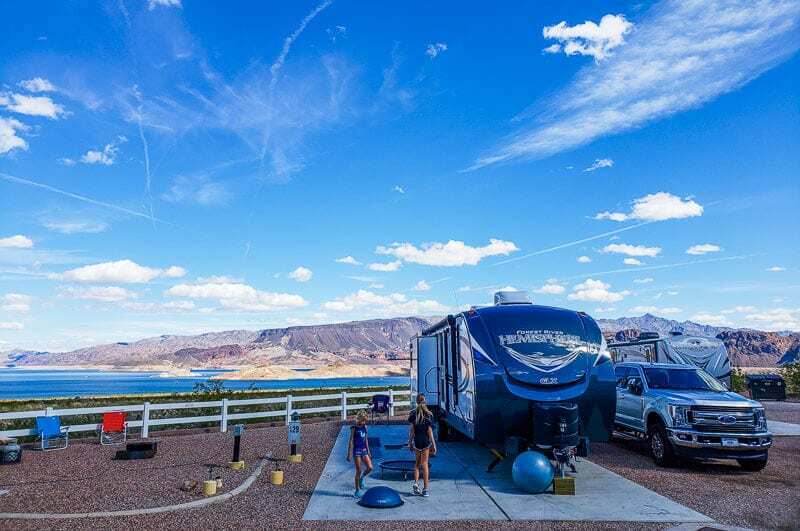 This week was all about taking it slow and enjoying the stunning lakeside views and desert landscape from our campsite. I was happy to hear the coyotes howl at night as we sat around the campfire – finally a place we can have one again. I had time to set up a new homeschooling routine for the girls, catch up on work and exercise. We were able to use this time also to run a few errands – put Kalyra’s broken camera into Best Buy for repair. Thankfully I bought the protection plan for it. We usually don’t bother for us but for kids, I think they are worth it! We have to get her Chromebook repaired as well. Not good as it’s only a few months old. I’m not sure I really like Chromebooks. My favorite thing this week was experiencing the signs of Spring. It’s one of the most divine experiences of your life, to suddenly, after months of death and cold, to hear the birds vibrantly singing, to experience bursts of lime green leaves appear overnight on the trees and feel the warmth of the sun on your body as you explore in shorts and a T-Shirt. I wish I could bottle up that feeling of relief, hope,and expectation. I am so looking forward to packing away the heavy clothes and having way less laundry to do. God I’ve hated RVing in the winter. I’ve already started my spring cleaning in the living area and kitchen. I just have the bathroom and bedrooms to go. Thankfully our home is so small it can be done in a couple of hours! 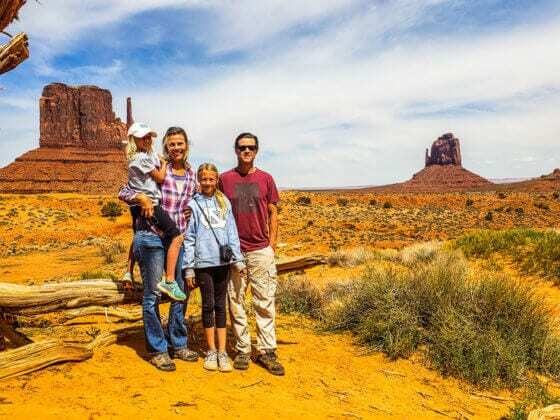 This week 14 wrap up of our USA road trip shares our adventures from Saturday to Friday. 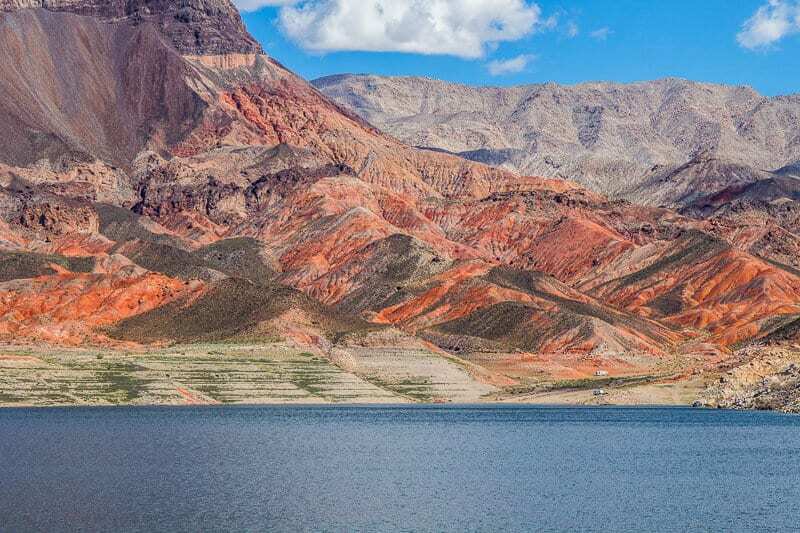 Lake Mead lies on the Colorado River, just after it makes its turn out of the Grand Canyon. 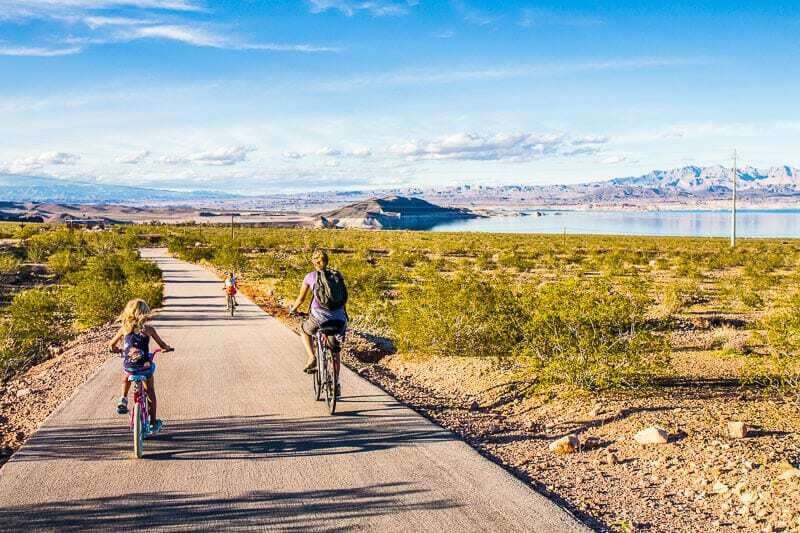 Lake Mead Recreational Area is a playground of striking landscapes and brilliant blue waters offering opportunity for hiking, biking, fishing and water playing. 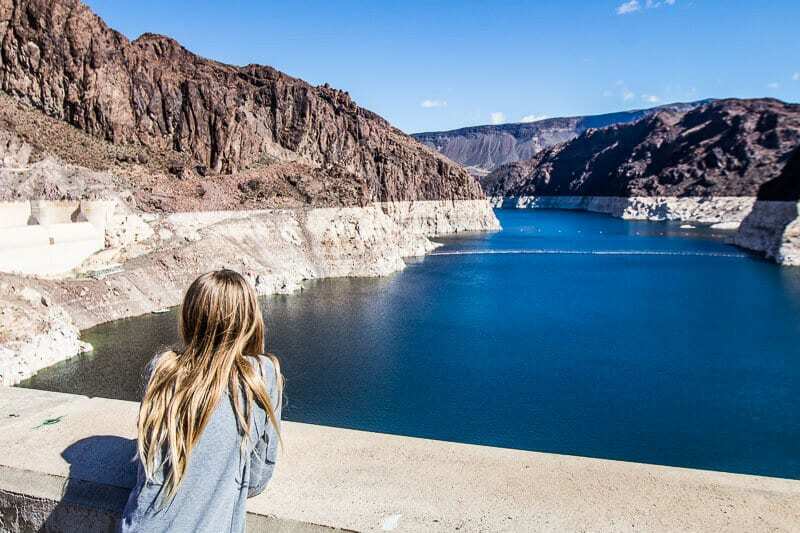 It was created as a result of the Hoover Dam and adds a way better experience to your Las Vegas trip! 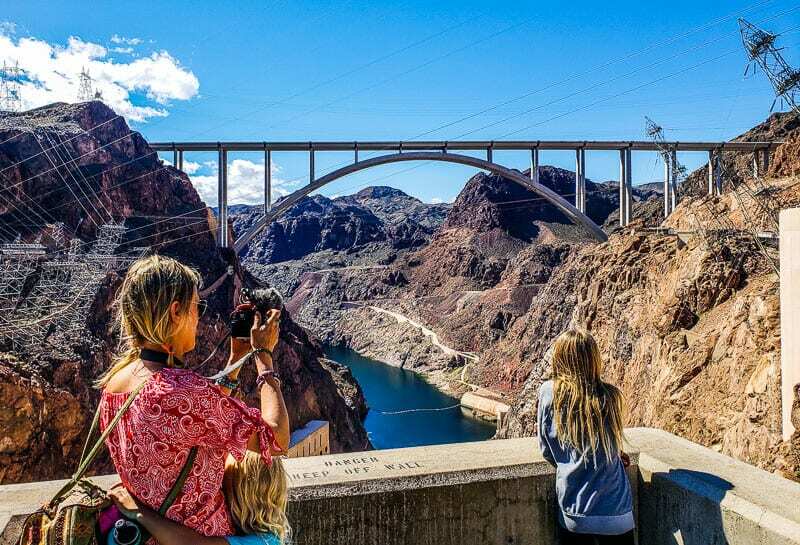 It’ shows as one of the greatest engineering feats of the 20th Century, this concrete arch-gravity dam was created in Black Canyon to control the river and provide water to the surrounding farming areas. 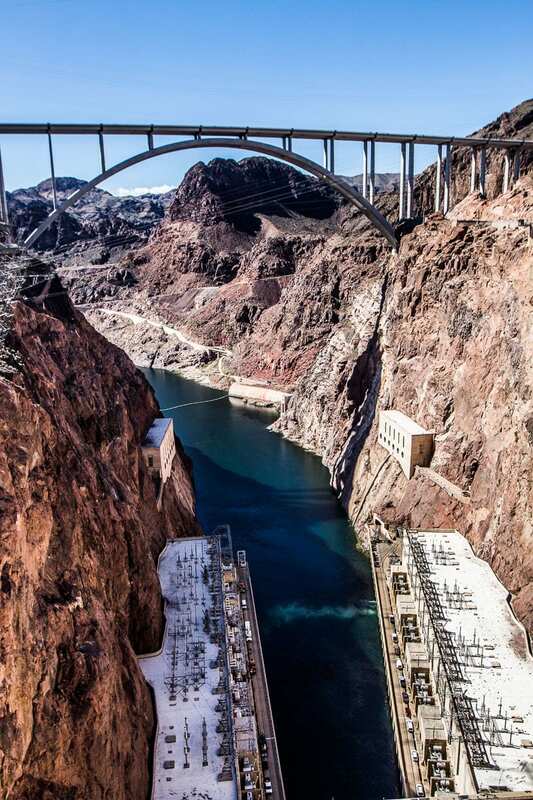 It’s the highest concrete dam in the Western Hemisphere, standing at more than 725 feet above the Colorado River and one of the biggest suppliers of hydro electricity in the country. There was a problem with the elevator when we visited so could not go down on the tour of the power plant, which is meant to be fascinating. Apparently this is a common problem as they are quite old. 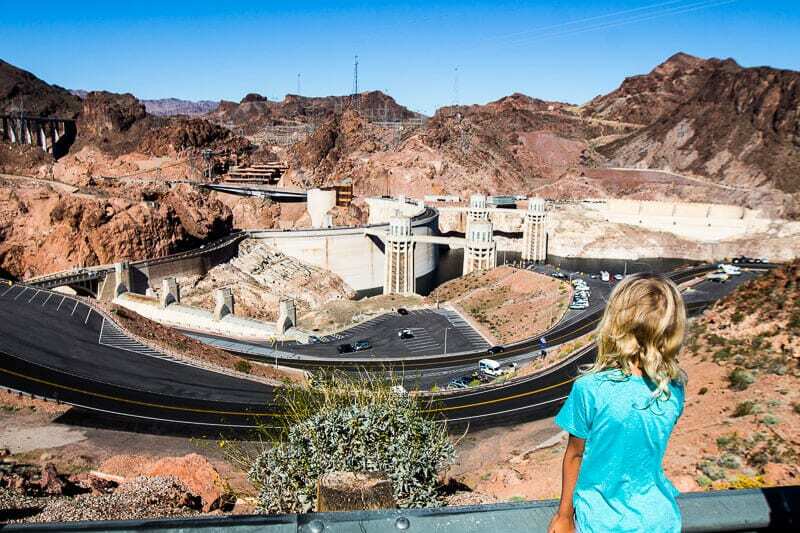 Instead we wandered around the Hoover Dam area taking in the various viewpoints (from the Arizona and Nevada side) and learning more about the development of the dam and how electricity is made at the Visitor Center. What was quite shocking was an insight into how much water has been lost since 1992 due to drought and way too many people now using the water supply. Check out the white line where the water levels used to be! 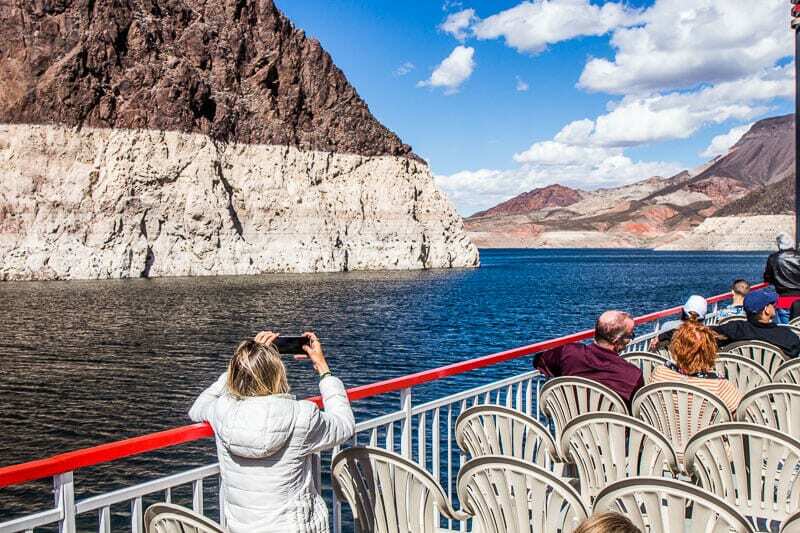 We followed our Hoover Dam Visit with a lunch cruise on Lake Mead. We cruised down into Black Canyon to the border of the Hoover. 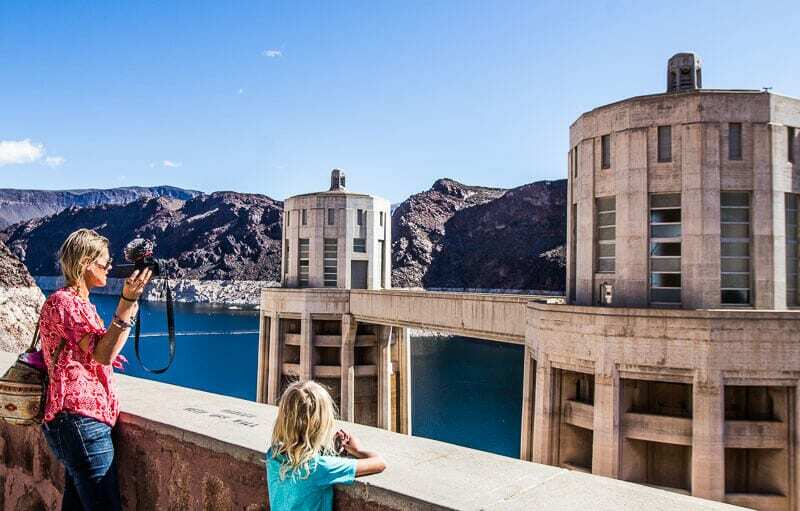 Seeing the dam from this side gave us a full perspective of what Hoover dam has helped to create. It was a very relaxing 90 minutes. A lunch of turkey salad deli sandwiches is provided and there is a bar on board the Desert Princess. 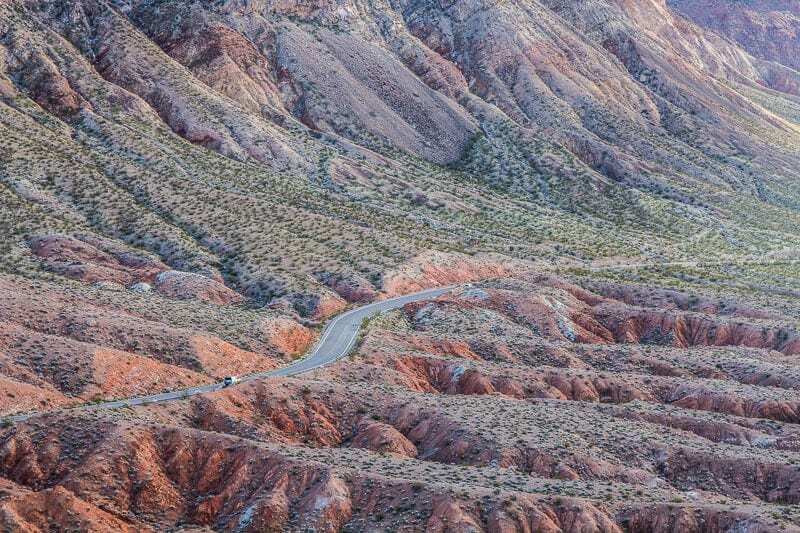 The colors of the rock along the way make it all worthwhile. 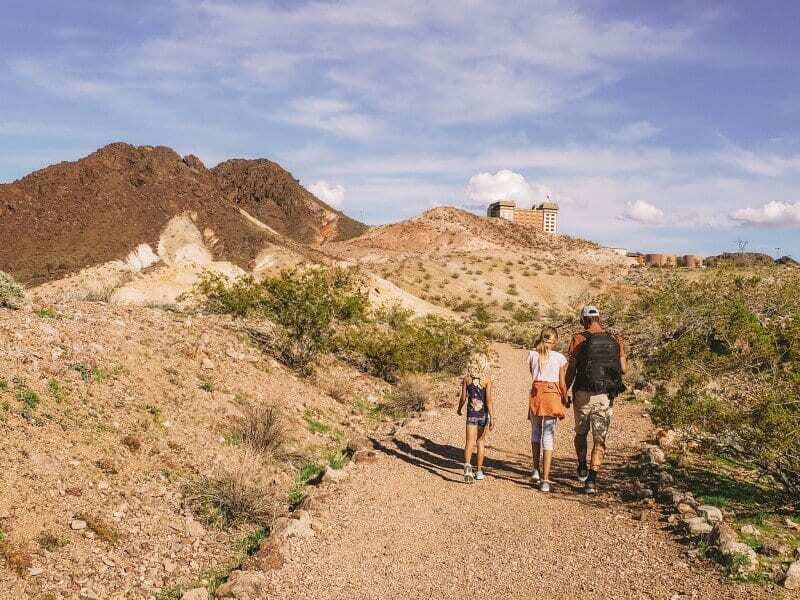 This tour was part of our Las Vegas Sightseeing Pass, which is a city attractions pass that offers savings on popular attractions. We’ve used them for New York, LA, and New Orleans and find they offer great savings. One of my favorite things was jumping on our bikes to ride 2 miles away from our campsite to the Historic Railroad Track. It was uphill the entire way. I was so proud of how well the girls embraced the ride. They were worn out when we got to the start of the trailhead though and were whining like never before. I was contemplating scrapping the walk, but it was only a short one and involved tunnels. I’m glad we dragged them along because once we started, they began chatting about their dreams, and the complaining disappeared. We had spectacular views over the lake and Boulder Islands as we walked along the old trail that used to bring workers and supplies from Boulder City to Hoover dam. 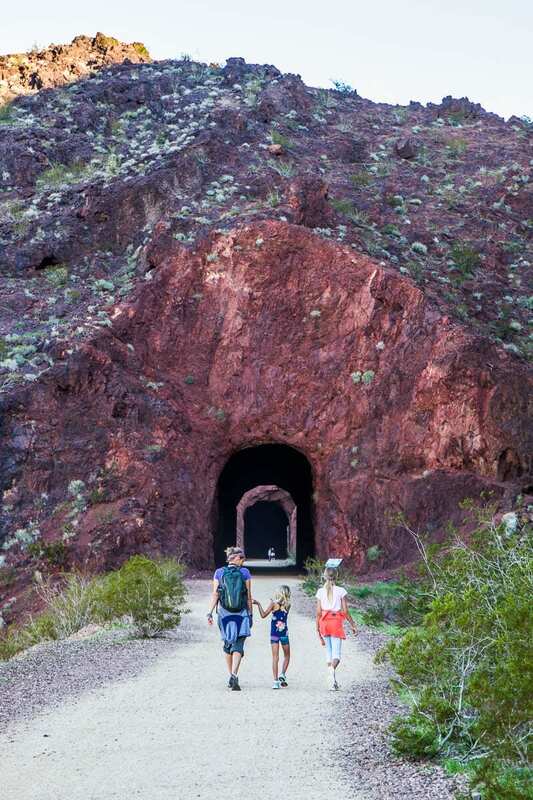 The trail has five tunnels you can walk through that eventually spills you out at the dam. Unfortunately tunnel 3 is no longer safe to walk through as the trail closes after tunnel 2. It was a cool hike and very family friendly. What I loved most was the opportunity to see how powerful and strong my girls are – and for them to get to know that about themselves too. What a surprise we had on an afternoon drive to the Redstone Trail. 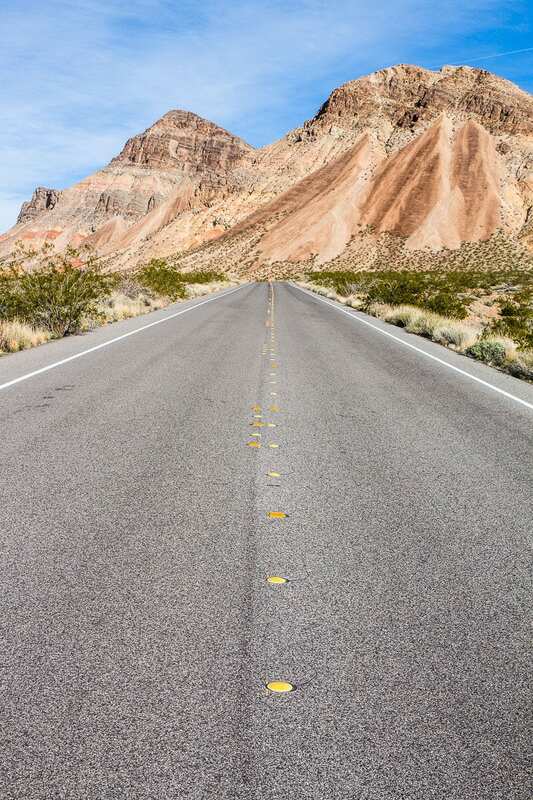 The Northshore Drive at Lake Mead was spectacular! 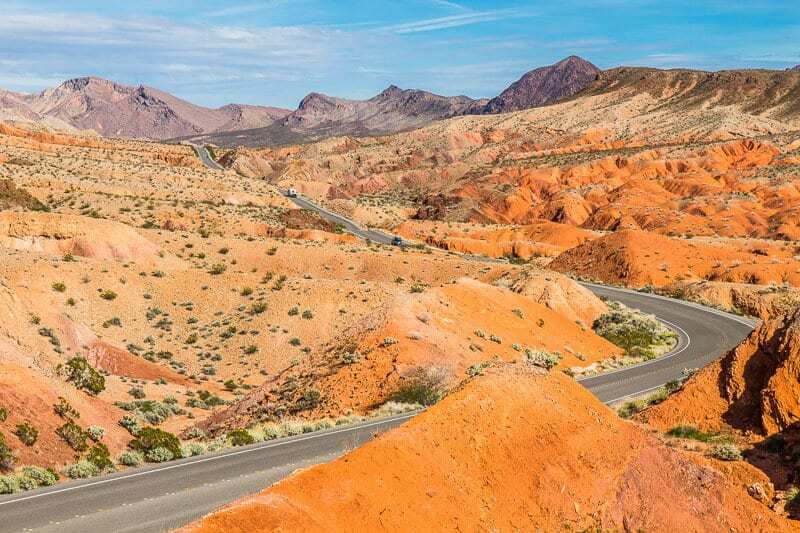 The kaleidoscope of color and diversity of landscape reminded me of Highway 12 in Utah. It’s only a short drive with plenty of pullovers for views and photos. The half a mile Redstone Dune walks take you through what once was sand dunes making this area look like the Sahara Desert. It’s now beautiful red rock outcroppings you can wander around. We also did the very short trek up to the Northshore summit for stunning views over the valley. In the distance we spied a brilliant cropping of red peaks which I’m guessing must have been the Bowl of Fire. Nightly campfires haven’t happened as much as we’d like. 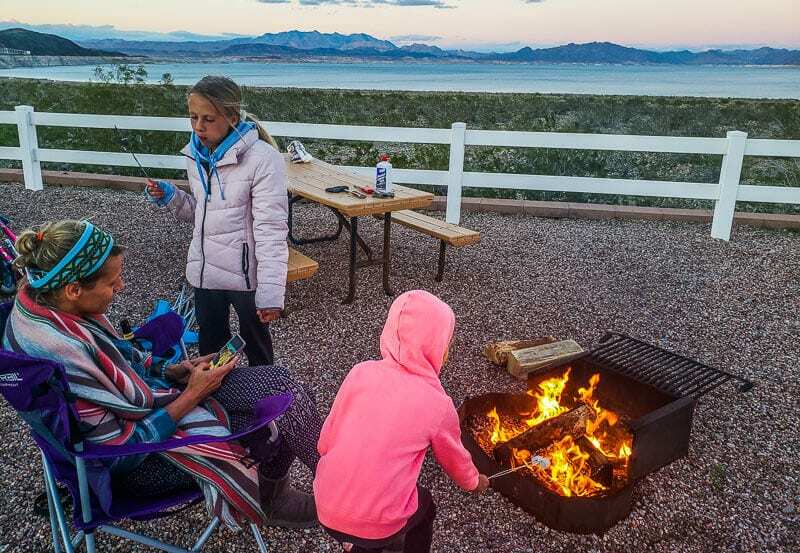 Many of the places have campfire bans. So we rejoice whenever the opportunity comes to burn some wood and make toast some s’mores. Once again, weather is proving problematic for travel planning. We won’t be able to hike The Narrows in Zion National Park, which I was so looking forward to doing with the girls. In case you didn’t know this is a water wading hike through a narrow canyon. Being early spring the water levels are too high to be safe! I know the girls would have loved that adventure! AND many trails are closed there at the moment due to storm damage. It’s too cold to visit as we wanted to do this week. Facebook Messenger is fantastic for kids to keep friendships happening with people they meet on the road. The girls are currently chatting away to their friends form the crazy Family adventure. We’re so excited to be traveling Utah with them again next month! 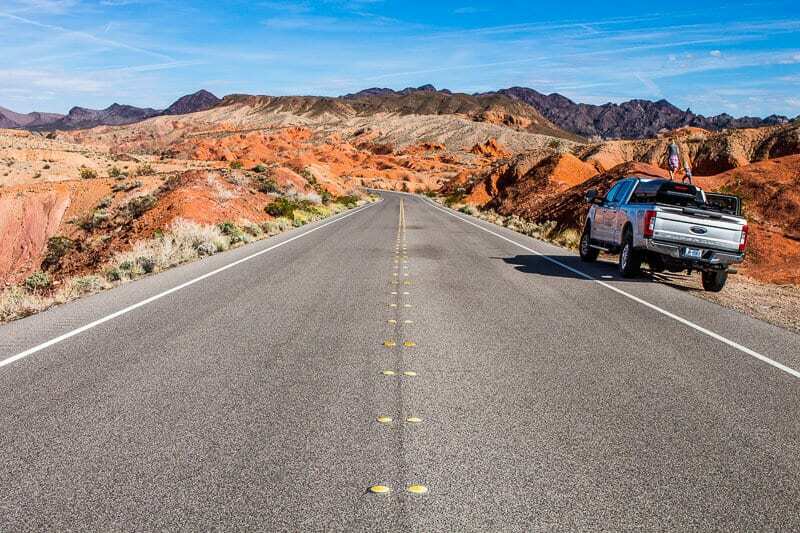 If you’re looking for an RV resort close to Vegas look no further than the Oasis RV Resort. 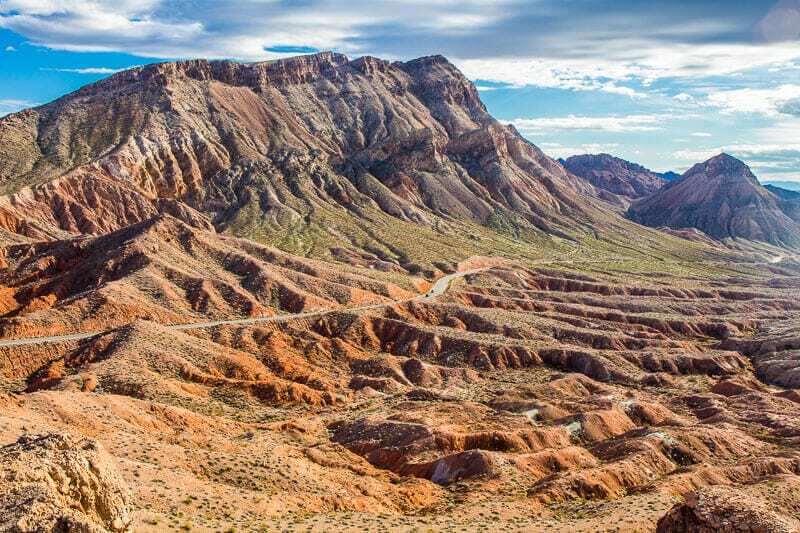 This is a fantastic option and is only about 10 minute drive south of the strip. It’s clean and well maintained with gorgeous resort style heated pools. You can’t roller blade, scooter or skateboard here though which upset the girls. The sites were a little on the small side though. 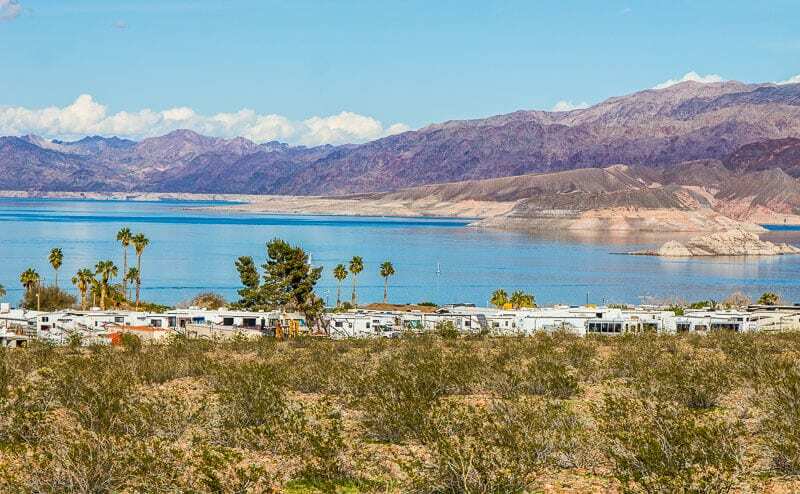 The best thing about this RV park was its location on Lake Mead. We were lucky get a lake view site – all they had available. The sites were quite large, very clean and with these beautiful views. There is something so calming about the water, so it was lovely to have it there all day to look at when I was exercising, working, meditating or just sitting by the fire. I didn’t like the showers too much though. Only two showers for a rather large RV park and they were so dirty when we went – but that is generally what you’ll get. I’m using Goldie’s shower more and more now. Wahoo!!! Check out our totals for this week. Finally we come way under budget! That’s what happens when you just chill out by the lake. No coffee or eating out!! 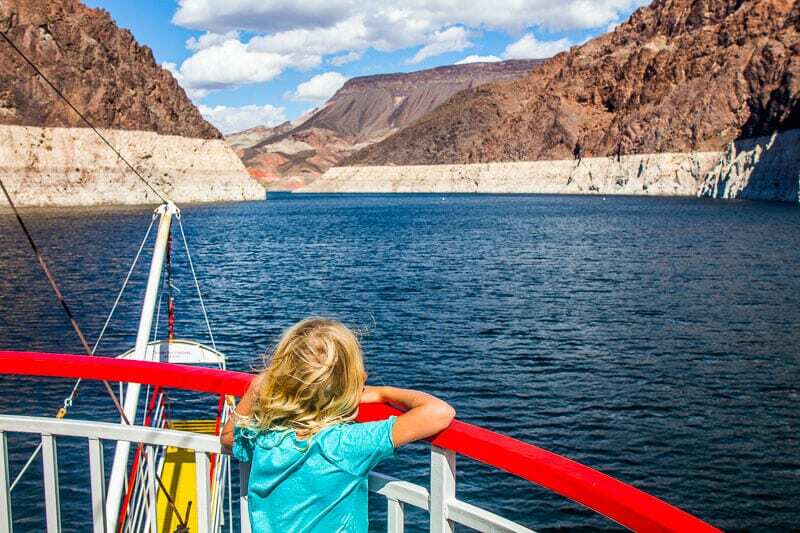 * For the above Hoover Dam and Lake Mead Cruise it would have cost $444 total to purchase them individually (family of 2 adults 2 kids). It’s worth noting that the children’s pass for Vegas cost the same as the adults. I think this is because Vegas has mostly “Adult” attractions. There are many the kids can still do though, including some of the night shows. It’s worth thinking about. Definitely do careful research so you know you’ll get the savings from it. As mentioned above, the weather is causing all sorts of havoc again. We contemplated visiting Death Valley again, but they had flash floods the other day which has caused more damage and closed roads. Zion and Bryce Canyon were taken out of the equation because of storm damage, snow and freezing temperatures. We thought about driving all the way to San Francisco, even storing Goldie and just staying in a hotel there. I mean the weather is always cold in San Fran so it doesn’t really matter when you visit. But, it was working out to be too expensive and well I just couldn’t be bothered driving 9 hours there and then 9 hours back again. 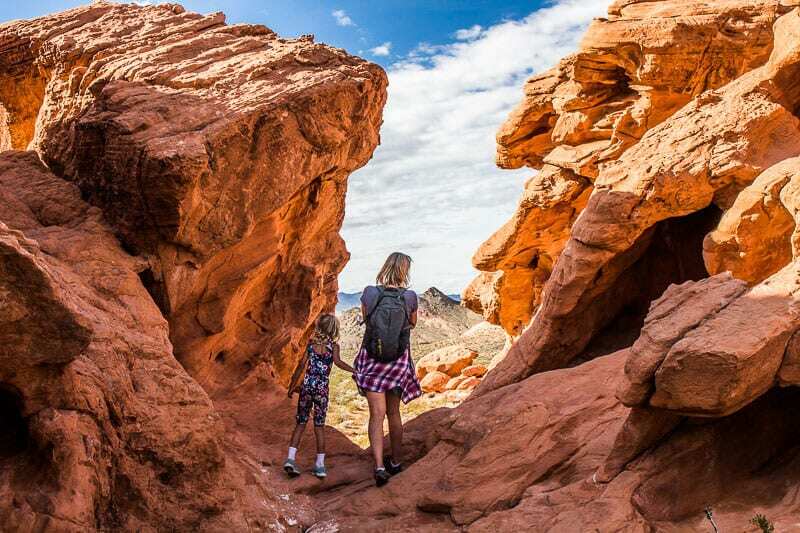 We are catching up with friends here in Vegas at the end of the month so want to stay around this area before moving into Utah to travel with the Crazy Family Adventure crew. 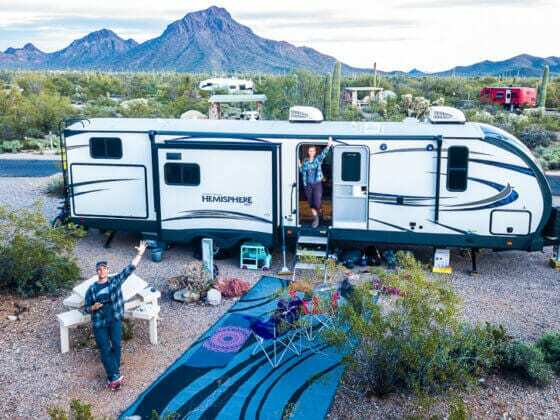 So we have two more nights at our campsite at Lake Mead, which gives us more time to plan, to spring clean, and to catch up on work, as we are in the middle of putting together a VERY exciting proposal. Stay tuned. 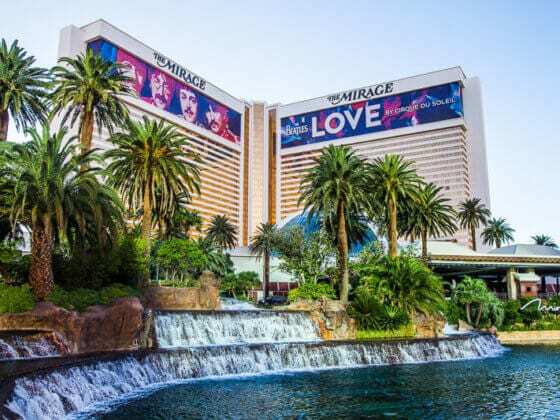 As there are things we want to do in Vegas to experience our Sightseeing Pass and have lots to write about for you all, we’re contemplating staying a few nights in a Vegas Hotel this week and taking in a few shows etc. That may give the weather in Zion and Bryce a chance to warm up so we can go there before coming back to Vegas! Otherwise, we really don’t know what to do! We’re kind of boxed into this area because of the weather. I feel like we’re wasting time as we are only on the road for a year, but what will be will be. Sometimes the staying still and being slow is just as memorable. 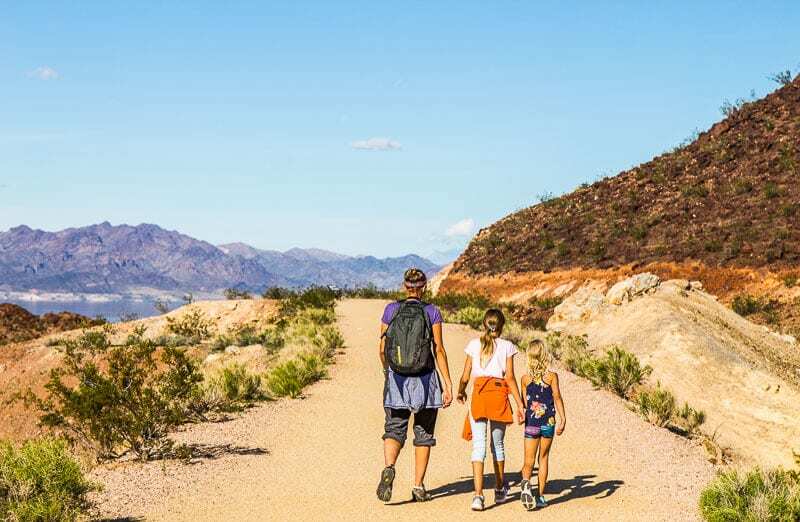 Our latest in-depth post is published on 18 Amazing Things to do in Tucson, Arizona.